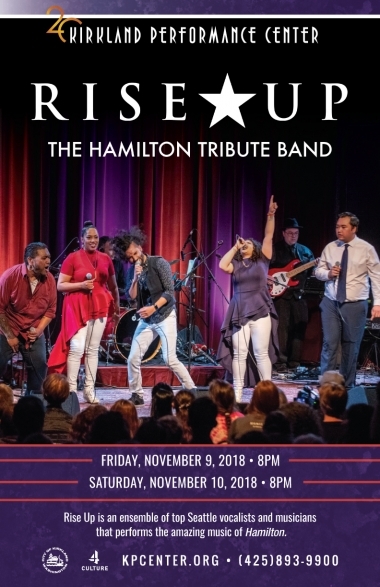 Don’t throw away your shot to see Rise Up, the Hamilton Tribute Band! Rise Up is an ensemble of top Seattle vocalists and musicians that performs the amazing music of Hamilton. Hamilton is a record-breaking Broadway musical and winner of 11 Tony Awards including Best Musical. It is a sweeping national cultural phenomenon with music that marries hip hop, R&B and Broadway. Rise Up is an ensemble of top Seattle vocalists and musicians that performs the amazing music of “Hamilton”. The members of Rise Up came together to bring a musical message rooted in diversity, perseverance and dreams, and have encountered enthusiastic response at every turn. Rise Up has performed extensively throughout the Northwest at venues including The Triple Door, Columbia City Theater, Alberta Rose Theatre in Portland, Hard Rock Cafe Seattle, The Royal Room, Bake’s Place, Bite of Seattle and numerous others. Rise Up features: vocal director and vocalist Mikaela Romero; musical director and pianist Jim Horne; vocalists Bo Mendez, Denny Le, Po (P.O. BOXX) Leapai, and Rebecca Garcia; violinist Alicia Rinehart; keyboardist Sam McKelvie; bassist Jeff Brumley; and drummer and bandleader MC Burning Sensation.